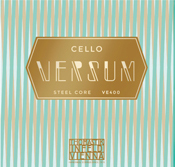 Latest Steel core strings for the professional Cellist. Thomastik finally has solid core A and D to compete with popular brands like Larsen and Pirastro. The G and C offer all the appeal of Spirocore Tungsten, but quick break-in, and fit seamlessly in the set. 4/4 size only.